Oops, I’ve been using the wrong harness for years. To keep my dog from pulling I’ve been using a harness that makes dogs pull more (and it’s ugly). Laika uses a harness occasionally. I myself don’t like using it but for some reason my boyfriend likes it more than her backpack. When he comes along to the park or for our daily walks he uses the harness, I stick to the backpack. Not that this is going to turn into “I was right, he was wrong” but that’s just the way it is. I have no problems walking Laika when she’s using the backpack. She’s more attentive to me and stays more focused on the task at hand – walking. While using her harness it’s another story. She pulls, lunges, and loses focus anytime something makes a noise. It’s really not fun. For some reason I’ve been under the assumption that it’s because we’re usually out at the park where there’s just so much more stimulation to begin with. Laika modeling her back hooking harness. She pulls a lot when using this harness as you can see. 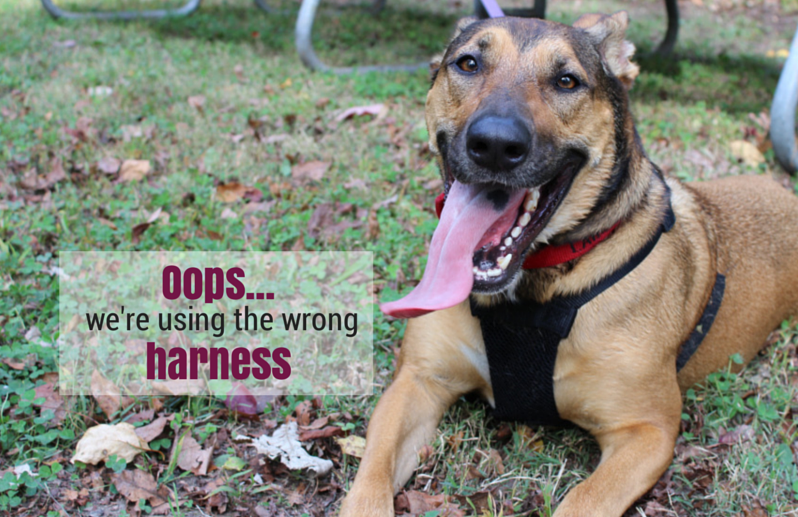 In general I avoid harnesses that hook on the back unless you want to train your dog to pull a cart or a sled. These harnesses actually help train your dog to ignore you and pull you because when you pull on the leash to try to gain some control, they direct the dog’s attention away from you. So there you have it. I’ve been using the wrong kind of harness for years. It was an impulse buy from the local pet store. I was browsing and came upon the harness section. I’ve seen many dog trainers use harnesses so I thought I’d pick one up. Surely if it’s a tool the professionals use we could get some benefit from it. Not every dog owner needs to be an expert, I’m not even close. What I failed to do was research. I could have read some reviews or watched some videos. I’m pretty sure I could have found out within five minutes that my purchase had been a mistake. Instead I assumed all was well and my dog was just pulling because she was getting too excited. Why didn’t I read anything about harnesses? I really don’t know. I’ve done a ton of research on dog bowls, frisbees, backpacks, and Kongs. How the harness slipped by I’ll never know. I’ve retired Laika’s harness, it was ugly anyways. If I ever decide to take up cart pulling I know I’ve got the right harness for the job; for our regular walks it makes it much more difficult. If I decide to get another harness I’m going to opt for the proper kind; one that hooks in the front. Harnesses that hook in the front get the dogs attention when they pull and they’ll come back to you. 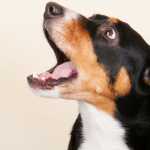 Your movement will help guide the dog to go in the same direction as you if they decide to chase a rabbit. There’s also the no pull harness option. It has a band that goes around the belly and around the chest, with a hook on the front that discourages pulling. It’s designed for untrained dogs that pull. For now I’m going back to the backpack. I don’t know if my boyfriend thinks it’s dorky or what but I’m also going to have to train him to get used to it. We kicked off #DogWalkingWeek today with the backpack, and it was wonderful. Laika does so much better on walks when she’s wearing the backpack. Now that I’ve done a bit of research I’m confident the same will be true of our next harness as well. So the moral of the story is; don’t buy a harness with a hook on the back for dogs that pull. Lesson learned. 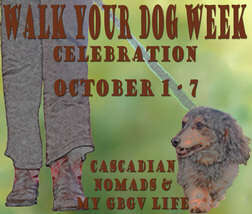 The National Walk Your Dog Week Blog Hop is hosted by Cascadian Nomads and My GBGV Life. Dog bloggers are invited to join in on the hop with dog walking related posts throughout the week. They hosts also a great giveaway going on so be sure to check it out. 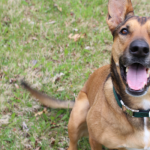 Get out with your dog this week and enjoy #DogWalkingWeek; take a moment to enjoy the simple things in life, like a nice long walk with your favorite canine friend. May I suggest you keep the pulling harness and purchase a sled, find some snow and let Laika go? Just kidding. We only have collars for walking, but Bailie and I each have a special harness for nose work, and Bailie has a whole different one for tracking, then we have our seat belt harnesses. Trainers told Mom we would know the difference in the harnesses by how they feel and she was right because depending on what harness Mom straps on, we know exactly what to do, so I bet the pulling harness really makes Laika want to pull. Humans don’t have it easy figuring out why we do what we do. Thanks for joining our #DogWalkingWeek! The funny thing is we’ve mentioned that many times. She would love nothing more than to pull a sled in the snow I’m sure, I just haven’t tried it yet – not sure exactly where we would try it out. 🙂 It is amazing how much they teach us and how they pick up on such subtle cues; I know the police K9’s here are also taught to behave differently depending what gear they have on. Thanks for stopping by and I’m loving #DogWalkingWeek so far! Sometimes we use a front clip harness for Jack, but usually just a martingale collar – he’s not a puller, so it works just fine. 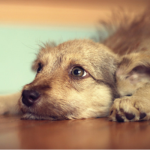 One day Laika won’t pull anymore, especially now that I’m going to make sure I’ve got the proper equipment… I seriously had a “DOH” moment when I read that article and proceeded to hang my head in shame…I guess we never stop learning. I agree. I haven’t had much luck with harnesses that clip on th back either. I love the head halti’s. You can also try a harness with clips on the front and back, and get a leash that has clips on both ends. Victoria Stilwell makes one. I’ll have to check that out, thanks. I definitely need to get a new one. Thanks for stopping by; it’s just one of those things I guess – live and learn. I haven’t chosen a new harness yet but I’m sure it will make a world of difference. We pretty much stick to collars for waking. If we ever go the harness route, I will keep this post in mind. Sweet – I’m going to look into that for sure. It’s really amazing how many options there are so I love having personal input. Some harnesses have the front and back clip option, but we generally use very basic collars. Someday we want to try carting (mainly with Kronos who has decided he’s on a mission when we are on a walk and he wants to get where he is going as quickly as possible), and then we’ll be getting the special/appropriate carting harnesses to go with the cart. Or maybe weight pulling. Anyways, the K9 Julius harness works really well and doesn’t seem to encourage pulling much (actually Kronos pulls much less with that than his normal collar). Good luck on your quest to find your favorite walking equipment! 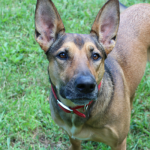 Thank you so much for the suggestion – I’m going to look into the K9 Julius – it’s a bit overwhelming how many different harnesses are out there on the market. And now that I’ve been doing more research I’ve realized I’m going to need more than one for different activities. Thanks again for the suggestion. I often recommend the front clip harnesses, such as the Easy Walk or the Freedom Harness, to my clients. They work great for walking and for helping dogs learn not to pull. Much better than back clip harnesses, which just encourage more pulling! However, many of the front clip harnesses sit too low on the dog’s shoulder and do interfere some with the dog’s movement. As well, some of them also rub the dog in the armpit / behind the front leg, depending on how the dog is built. Thank you so much for the information. I ended up getting a Freedom No Pull and it’s working awesomely so far. We haven’t had any issues with it rubbing yet though Laika decided the first few times that since she doesn’t feel right pulling anymore jumping straight up into the air must be the best way to move forward… It’s going much better now. I’m definitely going to check out the Lori Stevens once now, thank you.